It was in Dunedin, in 1871, that the first semblance of order came to the game of golf in New Zealand. From humble beginnings on nine holes in a pasture, only "half an hour’s stroll from the Central Post Office", the game has spread throughout the country. The earliest reference to the game in New Zealand came in September, 1863, when the Otago Witness carried an advertisement seeking "gentlemen desirous of forming a golf club". While there was no shortage of gentlemen in Dunedin at that time, there was obviously a lack of interest in the game, for it wasn’t until 1869 that the first balls were struck. The man behind the move has become a legend. He was Charles Ritchie Howden, the father of New Zealand Golf. Howden was the sort of Scot on whom the early prosperity of Dunedin was based. By 1871 he was financially secure, as well as young and enthusiastic enough to be a driving force behind the development of the game. It was only to be expected that when a dozen players gathered to form a club in September, 1871, that it should be Charles Ritchie Howden who became the first Club Captain. The same meeting set the annual subscription at a guinea and gave the Committee the task of securing equipment for members. No clubs or balls were available and members had to send to England for what they required. He was inducted into The New Zealand Golf Hall of Fame. The 28 members of the new organisation decided that its name should be the Dunedin Golf Club (later the Otago Golf Club). 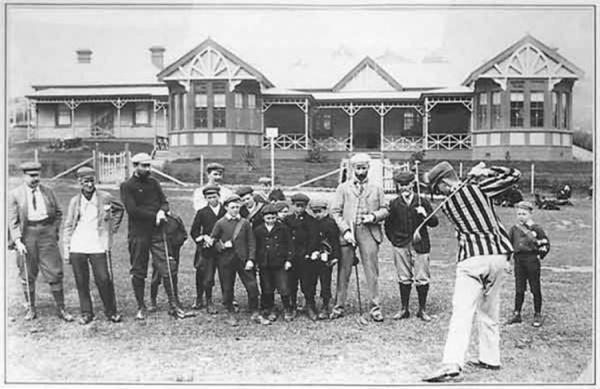 The first few games were played at Caversham, but early in 1872 the City Council gave permission for the establishment of a golf course at Mornington. The nine-holer was laid out by Howden and a Committee member. The first tee just happened to be very handy to Fogarty’s Hotel which soon provided a locker room, Clubhouse and the first ‘nineteenth’ in New Zealand. Fairly regular competitions proceeded for a couple of years but the very nature of the Course assured it of a short life. The final blow came in 1876 when the ‘nineteenth’ changed hands. The new landlord soon found himself in bankruptcy and the ensuing sale saw a member of the public secure a complete parcel of all the members’ golf clubs for two pounds. When the clubs were tracked down a year later, they were useless. Without a playable course and without equipment, players found the whole business impossible. It was nearly twenty years before golf once again took organised shape, but in those early years four historic trophies had been established: The Bruntsfield Medal, The St Andrew's Cross, The 1871 Cup and The Telfer Medal. On 22 June, 1892, the promoters of the Dunedin Ladies Golf Club met at the home of Mrs Kate Ogston. A Club was formed and the links were to be at Roslyn. The first officers elected were President Mrs Ogston, Secretary and Treasurer Mr Sievwright. Committee Mrs Stilling, Mrs Colquhoun and Miss Howden (daughter of Charles Ritchie Howden who established the Otago Golf Club in 1871). The subscription was set at five shillings. It was resolved that the Otago Golf Club be offered two thirds of the subscription, the remaining subscription was to be used for their expenses. The women continued playing golf but the next formal meeting didn’t take place until May, 1893, when they were asked to consider admitting boys as members, which was agreed to. The same year saw the name changed to the Otago Ladies Golf Club. In November, 1893, the Otago Ladies Golf Club held the first Amateur Championships of New Zealand. It was also the year the English Ladies Golf Union was established and New Zealand women were first able to vote in a general election. In 1895 the Otago Golf Club felt the need for closer liaison with the women’s club. Mr Somerville, the New Zealand Amateur Champion, became a committee member of the Ladies club. He was able to offer the Ladies club valuable assistance in dealing directly with the Otago Golf Club. Since 1896 the Otago Ladies Golf Club members have been golfers of all abilities and some have gone on to achieve higher honours playing for Otago and New Zealand. 1896 saw the shift to the present site of the Balmacewen course for both the Otago Golf Club and the Otago Ladies Golf Club. The two clubs have played on the Balmacewen course for well over 100 years. Both clubs have the special honour of being the oldest men’s and women’s golf clubs in the Southern Hemisphere. In 2009 the Otago Golf Club and the Otago Ladies Golf Club amalgamated to create a new history as one Club. More history can be found in The Otago Ladies Golf Club Inc 1892 -1992 written by the late Ada Fache, a past member of the club.